This chiller also comes in a water efficient version that uses less water. first chiller thought being elevated would decrease cooling time. Did exactly what I expected it to do. Within a half hour was at pitching temp. No mess great design cleans up easily. Hassle free. Just buy it!!! Just used this to cool 5 1/2 gallons of wort. It was a little sort for my 14 gallon pot but I just stretched the bottom down a little and it now fits my taller pot. I changed the water in line to compression fittings to prevent any leaks. It cooled my wort from 200 down to 75 in about 20 minutes. It probably would have been quicker if I stirred the wort while cooling. No more messing with ice or adding cold water. This is probably the best chiller you are going to find in this price range. It works as you would expect and does a fine job. Probably not the choice for 10 gallons but for 5 it will do the job. I used to let the batch sit in the kettle overnight to cool. Now I can finish, pitch, & clean up all in one session. Makes life with the wife much easier. This one is good both indoors and out. Mine has leaked around the hose clamps since day 1. Chills really good though , gets me down to pitch temp in about 15 minutes. Cools down 5 gallon wort from boiling to 70 degree F in about 15 minutes. Cheap tubing for water attachment and will melt easily but you can replace it with higher temp stable tubing. Nice entry level chiller, you could do better but you'll also pay a lot more for it. Works great and while chilling if you swirl it chills fast and adds oxygen back in. An essential to the beginner brewer. 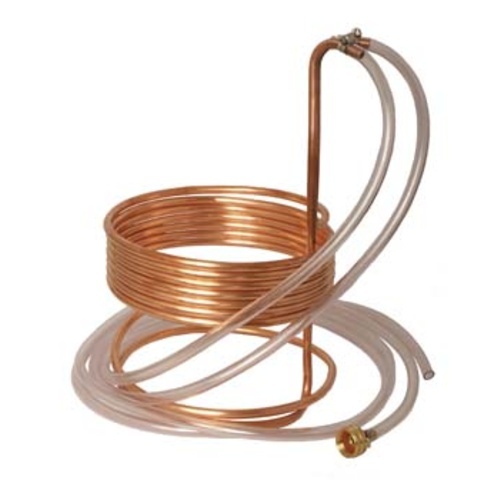 And when you want to upgrade reuse the copper to make your own counterflow, or use it as a pre-chiller for whatever other new chiller you may want. I got this for my 5 gallon kettle and sped up my chill time significantly from the ice/sink bath method. Upgraded to a 15 gallon heavy duty kettle an it still works but not as well as you might imagine. Make sure you tighten the screws on the tube clamps as tight as possible or they will leak. This wort chiller is good for what it is. It cools wort relatively quick, but uses quite a bit of water to do so. The ease of use can't be beat. Just throw it in before he end of your boil to sanitize it and turn the water on. Make sure the clamps are tight where the tubing meets the copper. I should have bought the taller one. Great wort chiller. Does the job, but I should have bought the taller one for my 10g kettle. Must have product. Speeds up cooling time. I'm now able to get a full 5 gallons down to 75 in around 15 minutes. I've found that not stirring the wort gives me a better separation with the hops. I have been using this chiller for 3 years with no issues. I used this outside. hooked it up to a garden hose and the wort went from 212 to 77 in about 35 minutes. when i tested the chiller the night prior, there was a slight leak but a bit of tightening on the clamps got rid of the leak. very efficient. If you don't have a chiller, you NEED one! This is the entry level chiller. Ice baths or letting the wort sit until it's cooled enough is a bad plan. You need a way to cool your wort fast and this will do it. Simply put it in a few minutes before the boil is over to make it sanitary, then hook up the lines and let it run. Mine is like this one. I'm going to upgrade to a counterflow but this works pretty well and gets the wort cooled below the magic bacterial favored temperatures pretty quick. This is a terrific chiller that works better than the borrowed home built chiller I used before I got this one. It is faster to chill perhaps because of its unique design and after pricing out the components at the home store this chiller was less expensive to buy that to make it myself and this is not counting the cost of my time. Took some getting used to. I use a cooler with ice cold water and a simple pump. Doesn't take LNG at all to drive down the wort temp. Buy with a kettle and they notch the kettle lid-- can't beat that. Very happy with this purchase. This is much faster than icebaths and just plain waiting for the wort to cool before pitching your yeast. If you don't want to spend a fortune in getting a plate chiller and a pump - this is your best alternative. Just connect it to your water in the kitchen, garage, or outside hose and you're in business. Depending on what temp your water is, it can cool it as fast at 12-15mins or maybe even quicker if you have a pre-chiller (very similar to this with less coils) and a icebath. Tip - I've found that if you swirl it around in the kettle as it's cooling the wort you can cool the wort quicker as well as mimic a whirlpool technique that breweries use which a lot of the sediment concentrates in the center of the kettle. That allows you to drain off most of your wort without a lot of protein coagulation getting into your fermentor. The less "junk" in your fermenter the better. I've had no problems with this chiller whatsoever. I'd recommend getting the larger size because you may upgrade your system some day. THis works great for 5 gal batches, but takes a bit too long for me for 10 gal batches. This is a pretty good product for quickly cooling down 5 gallon batches of homebrew. Make sure to check the fittings before each use to ensure that there are no leaks where the plastic hose attaches to the copper coil. This chiller is great for doing 5gallon batches. I do 10g now and this took too long to cool those. I had to switch to more beers CFC. If your doing 10g or more I would recommend a bigger immersion chiller or better yet a CFC or plate chiller. I live in the Phoenix area and this chiller does just an OK job chilling my batches. If you order this, make sure you check and tighten the hose clamps. I had a lose clamp fail during a chill, causing the outlet to push off the hose and leak a small amount of water into the wort. Luckily I was there to pull the chiller out; had I walked away, I would have returned to a ruined batch. Overall, it seems like this chiller takes slightly too much time to chill my batches, usually about 30 minutes, and I am using a pond pump to push ice cold water through it. I will eventually upgrade to something better. This product seriously cuts down your lag time from post boil temperature to less than 80 degrees in 10 - 12 minutes. Using this chiller with a pump, coil of copper in an ice bath I can get the temp down quickly with stirring. I would highly recommend this product for 5 gallon all wort boils. if you dont buy anything... YOU MUST BUY THIS!!! this has made making beer so much easier faster effecient... and if nothing else... cleaner!!! GET IT GET IT GET IT!!! this chiller works great. setup to work with the notched kettle lid so the lid fits tight. This wort chiller and my large brew kettle were the two most significant upgrades to me brew system and I now consider them indispensable. Having the ability to cool your wort in under 20 minutes makes the brew day smoother and eases some contamination concerns (the faster the wort is cooled and in the carboy, the better). You do end up pushing a lot of water through to cool your beer, but there are loads of creative uses for that water. Can't recommend this chiller highly enough. why did I ever wait so long to buy this? Seriously slashes brewing time. This pays for itself quickly if you buy ice to chill your brew. Make sure the lines are properly secured to the pipe or it will spray tapwater into your brew. Using a chiller has had the single largest impact on the quality, frequency and enjoyment of my home brewing. It gives me more time to "relax and have a homebrew" with my guests (or get on with the rest of my day)much sooner than before. This chiller is reasonably priced and took at least 45 minutes off of my brew day compared to water bath cooling. It's easy to sanitize in the last 10 minutes of your boil, or using the no-rinse sanitizer of your choice. I've had this for more than 2 years and it still works like new. This is the first wort chiller I've ever used so I can't compare the merits of this vs. other wort chillers, but boy did this make all the difference in the world - I can't believe it took me 10+ batches of beer before getting this. Cooled the wort to pitching temperature in less than 15 minutes (partial boil + a little extra boiling water added at the 60 minute mark to make sure the coils were covered). Nice, long hoses made it extremely convenient, brew kettle stayed happily on the stove, hoses went to and from the sink with plenty of room to spare. I do flower hops instead of pellet, and even so it was no problem to clean afterward - warm soapy water and it cleaned very easily. If you are looking to purchase your first wort chiller, I highly recommend this product. Wash with soapy warm water before using for the first time, and don't forget the faucet adapter if you are brewing in your kitchen.